The Empire State Building hit the market at a particularly tumultuous time, but office space is one of the most stable markets, especially in New York City’s midtown where the tech sector continues to grow. Empire State Realty Trust Inc., whose properties include Manhattan’s Empire State Building, climbed in its first day of trading after raising $929.5 million in its initial public offering. The real estate investment trust sold 71.5 million shares for $13 each, the low end of the projected range of $13 to $15, according to a statement yesterday by the New York-based company. 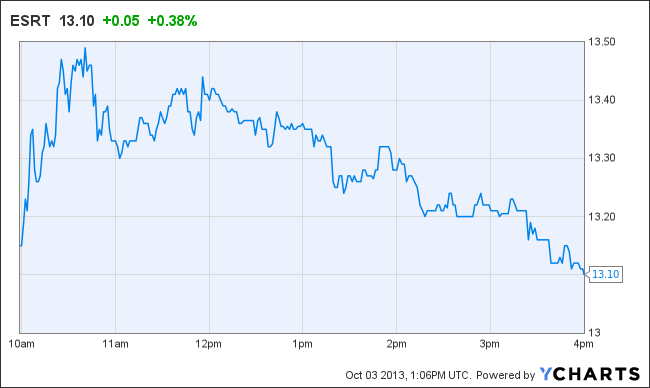 The stock closed at $13.10, up 0.8 percent, after earlier gaining as much as 3.8 percent. The sale culminates an almost two-year quest by the Empire State Building’s supervisors, Peter Malkin and his son Anthony, to take the iconic skyscraper and 20 other New York-area properties public, a process marked by battles with some of the tower’s longtime investors. Anthony Malkin, the REIT’s chairman, president and chief executive officer, said he was “not at all” disappointed that the initial shares priced so low. The low initial price reflects investors’ concerns about how the REIT will be governed and whether it’s ready for the rigors of being public, Michael Knott, an analyst at Newport Beach, California-based Green Street Advisors Inc., said in a research note today. Investors also aren’t sure how to regard leasing challenges at the Empire State Building and how to value the tower’s highly profitable observatory, he said. The skyscraper will face new competition in 2015 from the opening of the 1 World Trade Center observatory in lower Manhattan, according to Knott. The IPO was the second-biggest for a U.S. REIT, excluding an overallotment. Douglas Emmett Inc. raised almost $1.4 billion in 2006, according to data compiled by Bloomberg. Empire State Realty enters the market in a period of uncertainty over the U.S. government shutdown and a potential clash between President Barack Obama and Congress over the debt limit in two weeks. Interest rates have jumped since May, when the Federal Reserve signaled it could start curbing stimulus measures. The Bloomberg REIT Index dropped 14 percent through yesterday from a peak on May 21, while a narrower gauge of office-property trusts lost 9.7 percent. Empire State Realty’s offices are about 84 percent leased, compared with New York-area occupancy rates of 92 percent for SL Green Realty Corp, 96 percent for Vornado Realty Trust and 95 percent for Boston Properties Inc., according to their regulatory filings. The three competitors all have larger New York office portfolios than Empire State Realty, which has about 5.9 million square feet (548,000 square meters) in the city. The company also controls six retail properties in Manhattan and Westport, Connecticut, and five office buildings north of the city. At the opening price, the stock traded at a 16 percent discount to value of its buildings excluding debt, Knott of Green Street wrote today. Office REITs on average are trading at about 2 percent less than the value of their assets, while Boston Properties is at about a 2 percent premium, according to a Sept. 23 report by the research firm. Empire State Realty should benefit from spillover from the “hot” midtown south office market, according to Knott. Vacancy rates in the area, which is popular with technology and media companies, are the lowest among U.S. markets. Vacancies at the 82-year-old Empire State Building are in part the result of a $550 million improvement project, according to Green Street. Revenue has more than doubled on space in the tower that has been renovated, Knott said. The vacancies represent a “big opportunity” for investors, Anthony Malkin said in the interview. The Empire State Building benefits from not being popular among retrenching financial firms and already has a roster of tenants with high growth potential, including LinkedIn Corp., Shutterstock Inc. and Coty Inc. Most of the funds raised in the IPO would go toward buying out the estate of Harry Helmsley, which still has a majority stake in the Empire State Building’s sublease, according to the prospectus. Proceeds also would be used to cover transaction costs and pay debt. The Malkin family will own 15 percent of the trust’s shares, and about 50 percent will be controlled by pre-IPO legacy holders, according to Knott. The expiration of lockup periods six and 12 months from now, after which those investors could sell their shares, may hurt the stock price, he said in today’s note. A minority of the Empire State Building’s roughly 2,800 legacy unitholders challenged the REIT proposal, favoring to keep a steady income stream and the bragging rights that come with owning a piece of such an iconic property. In May, the Malkins received the necessary approvals from investors to proceed with the IPO. With assistance from Leslie Picker in New York. Editors: Christine Maurus, Kara Wetzel. To contact the reporter on this story: David M. Levitt in New York at dlevitt@bloomberg.net. To contact the editor responsible for this story: Kara Wetzel at kwetzel@bloomberg.net.